The truth is that there are so many differences when referring to etiquette and customs in business based on where business is done. Most people do not know anything about potential differences and expect that everything is exactly the same as where they are used to doing business. Some small differences appear in most cases and there are also situations in which really serious differences appear. An example of a small difference can be highlighted when comparing Canada with France. In France, the handshakes should be light while in Canada they need to be firm. This automatically means that you can botch the entire business meeting from the very first second as the handshake is totally inappropriate. 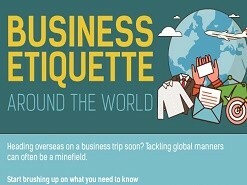 We are faced with so much information that we have to remember so the Business Etiquette Around The World Infographic can help us out a lot since it highlights so many aspects that people are not normally aware of when referring to some of the top business countries from around the world. You can easily learn the fact that in Israel you have to handle business cards with complete respect, handshakes have to be firm, you have to talk by using Mr. and Ms. and yet, the dress code is not strict. You will quickly notice so many different parts in this infographic. It is much more complex than what you might believe, highlighting exactly how to increase the chances that your business will run smoothly in the countries that you decide to visit. You will see when there is a need to have direct business communication or when indirect is better. You will see when you can expect to have to be involved in chit-chat before talking business and you will get to learn where you should never interrupt someone during business talks. Make sure that you do not dismiss the part of the infographic that talks about business etiquette during dining. You will find yourself in a situation in which you need to have a business meeting at a restaurant. Something simple like not holding your fork appropriately can lead towards problems. Go through the entire infographic if you want to do business in another country. You will surely appreciate the information offered.